Through hundreds of photographs, new maps and a fresh consideration of Grant's Virginia strategy and the generalship of Butler and Beauregard, this book explains the plans, events, and repercussions of the Bermuda Hundred Campaign. Robert E. Lee feared the day the Union army would return up the James River and invest the Confederate capital of Richmond. In the spring of 1864, Ulysses Grant, looking for a way to weaken Lee, was about to exploit the Confederate commander’s greatest fear and weakness. After two years of futile offensives in Virginia, the Union commander set the stage for a campaign that could decide the war. Grant sent the 38,000-man Army of The James to Bermuda Hundred, to threaten and possibly take Richmond, or at least pin down troops that could reinforce Lee. Jefferson Davis, in desperate need of a capable commander, turned to the Confederacy’s first hero: Pierre Gustave Toutant Beauregard. Butler’s 1862 occupation of New Orleans had infuriated the South, but no one more than Beauregard, a New Orleans native. This campaign would be personal. In the hot weeks of May 1864, Butler and Beauregard fought a series of skirmishes and battles to decide the fate of Richmond and Lee’s army. 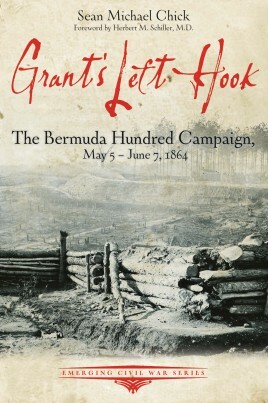 Historian Sean Michael Chick analyzes and explains the plans, events, and repercussions of the Bermuda Hundred Campaign in Grant’s Left Hook: The Bermuda Hundred Campaign, May 5-June 7, 1864. The book contains hundreds of photographs, new maps, and a fresh consideration of Grant’s Virginia strategy and the generalship of Butler and Beauregard. The book is also filled with anecdotes and impressions from the rank and file who wore blue and gray. Sean Michael Chick is a New Orleans native and tour guide who gives one of the only guided tours of the French Quarter concentrating on the American Civil War and slavery. He also volunteers at the Historic New Orleans Collection, writes for NOLA Defender (http://www.noladefender.com/), and contributes to Emerging Civil War (www.emergingcivilwar.com). His first book was The Battle of Petersburg, June 15-18, 1864. "Lee is Trapped, and Must be Taken"